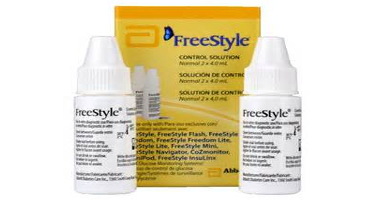 The FreeStyle Control Solution is a red liquid that allows you to perform quality control checks to ensure that your FreeStyle Blood Glucose Monitoring System is working properly and that your blood glucose results are reliable. It is not blood. Each Control Solution contains a known amount of glucose. If the control result is within an acceptable range, you know that your monitoring system is working properly.